John Stater of The Land of Nod (I know the hostname is ‘matt-landofnod’, I don’t ask questions about these things) wrote a book. Possibly more than one, but it’s only one that I’m going to talk about today. 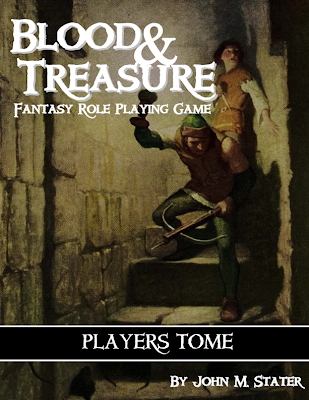 Blood & Treasure Players Tome is pretty close to being what I wanted from the AD&D first edition Player’s Handbook. Yes. I just wrote that. This is probably one of the best, closest-to-original old school D&D books I’ve found that I would actually work with. There are OSR systems that go even farther back, but to be honest I don’t much care for them. This one hits the sweet spot for me. Blood & Treasure draws material spanning several eras of D&D. It most closely models a mix of BECMI and AD&D 1e (the honest edition that I grew up with, we didn’t really play one or the other so much as a mix of both). It builds on more recent editions, particularly D&D 3.x and other Open Gaming Content. At the same time he draws from multiple eras, John also indicates from which era particular elements have been drawn. A class might be ‘Classic’ (back to the LBB and BECMI days), marked ‘Advanced’ (into AD&D first edition), or ‘Expanded’ (getting into second edition, and possible dipping a little into the d20 years). Oh, hey, didn’t a little company in Washington State say they were going to try to write a game that would blend across eras and versions of D&D? This structure brings some interesting baggage for me. First, ability scores modifiers that feel right to me. The simple formula in D&D 3.x and 4e is easy to work with, but it lacks feeling for me. 9-12 is +0, 13-15 is +1, 16-17 is +2, 18 is +3… the way I grew up with. Races are pretty consistent with AD&D, though a little simpler (dwarves get a straight +3 to certain saves, rather than “+1/4.5 Con” bonus (or was it +1/3.5 Con bonus? I forget). Most races also get ‘knacks’ that lets them use certain skills as if they were kind of skilled (more on that below). It looks like any race can potentially be any class, but only demi-humans can multiclass — in particular combinations, each of which contains the race’s ‘favored class’. You might have an ‘elven paladin’, or an elven fighter/magic-user, cleric/magic-user, or magic-user/thief. No fighter-thief (dwarves and halflings can be). Dwarves can multiclass as fighter/something, gnomes as illusionist/something, halflings as thief/something. Simple, looks like it’ll work pretty well. Four classic classes (cleric, fighter, magic-user, thief), seven advanced classes (assassin, barbarian, bard, druid, monk, paladin [not actually marked, but probably should have been], ranger), and a couple of expanded classes (duelist, sorcerer). Each class also presents a variant, a slightly different version the same class. Hit points follow the classic model, too — different die sizes by class, usually gaining one per level (rangers start with two, as in the old days) until reaching ten dice, then a fixed number of hit points per level after that. At a certain level (usually ninth, sometimes higher) a character may choose to build a base and have followers come to him. As I said, reminds me of the old days. Multiclassing is straightforward: pick a multiclass combination allowed to your race, use the ‘multiclass’ experience table (twice as slow as the cleric table), then pick and choose from the abilities. Both classes stay in step, so you get: the worst armor options, the best weapon choices, base attack bonus and saving throws of the two classes, all skills and spell casting of both classes. Easy, easy, easy. Feats are an optional rule. There are only 28 choices and you get one at first level, then one every four levels after that. Nothing big and profound, no complex structure to them (many are just a one-liner). Again, simple. Equipment is pretty much as the old days, but there appears to be no ‘weapon vs. AC’ table. Good. Armor Class is ascending, as are attack bonuses, so one of the better ideas from D&D 3.x made the cut, another good thing. Henchmen and hirelings can be found under ‘equipment’ too, cool. Alignments have two modes, the three-fold model (Lawful, Neutral, Chaotic) and the nine-fold model (LG, NG, CG, LN, TN, CN, LE, NE, CE). This could have been made clearer earlier, where I would see references to things like “this power is available to Lawful (LG, NG, CG) clerics”. It became obvious as soon as I found this page, but until then I was a little confused. Right after alignments, starting on page 43: Strongholds. This game explains about how to acquire, design, build, conquer, and run a holding. I’ll be honest, I didn’t read this section very closely, mostly because I was just looking for differences and unusual bits at this point. I’ve read a lot of different D&Ds over the years…. Time is rounds, minutes, turns, hours, movement is pretty normal, encumbrance works much as always. Saving throws using the D&D 3.x model of Fortitude, Reflex, and Will. Unlike attack bonuses, the target numbers count down, but you still get to add your ability score modifier. Saving throws, or at least their values, are sometimes used for skill checks as well, and I’ll get to that. Falling is a little different – in addition to the normal straight up damage, there is a chance based on how far you fall that you will be crippled (condition reducing your movement rate by half and gives you a penalty to Reflex saving throws). Disease, poison, and conditions are pretty consistent with D&D 3.x, though poison is really limited to four types: sleep, paralysis, mild (hit point damage), and lethal (Constitution damage until dead… 1d6 per round). Heroic Tasks are pretty much Blood & Treasure’s answer to skills. There are three levels at which you might know a skill used to perform a heroic task. ‘Unskilled’ means you get to make the relevant ability score check against a target DC of 18. ‘Knack’ (you have a knack) is much like Unskilled except the target DC is 15. ‘Skilled’ uses a target DC equal to the related saving throw — Bend Bars is a Strength check against your Fortitude save. If you are a Fighter, this is good (DC 13 at first level), if you are a Magic-User this is not so good (DC 15 at first level… except that you probably don’t have this skill on your class list, so you use it unskilled anyway). Again, this is pretty simple overall, and provides a consistent mechanism for having PCs skilled to differing degrees at different heroic tasks. There is an alternate ‘skill points’ system also provided, very D&D 3.x-style, but cross-class skills are an optional option, on top of the alternate system. Rather than a complex set of skill check DCs to remember, things that complicate the check add +2 to the difficulty, things that make it easier add +2 to the roll (or subtract 2 from the difficulty, whatever). Rules are also provided for naval combat, mounted combat, and various other adventuring situations. As always, they look pretty straightforward and playable, without delving into the mess of subsystems AD&D had. This spell makes a melee weapon deadly to undead. Any undead creature with HD equal to or less than your caster level must succeed on a Will save or be destroyed utterly if struck in combat with this weapon. Magic resistance does not apply against the destruction effect. Spells are listed in order by name, the same spell description applies to all classes that use the spell. Almost all of it, to be honest. As I said right at the beginning, this the Player’s Handbook I would have wanted back in the day. As much as I only skimmed some parts of it, it is because I was then confident in what I was going to see (and pleasantly surprised to find that fireball fills 33,000 cubic feet again!). Just about everything I looked at was simpler, more streamlined, but no less rich than the BECMI/AD&D I grew up with — the areas that were ‘less rich’ were areas we didn’t actually use anyway, such as weapon vs. AC, or irregular ability score modifiers (and exceptional Strength, though we used that because we wanted the awesome and somehow rolled a lot of Str 18 fighters… weird). The relative size of the sections is about right too, I think: 48 pages of character stuff, 16 pages of how to play, 64 pages of spells. For a book that aims to cover twenty levels of play, this is not at all a bad mix. Not very much, to be honest, and some of it seems kind of petty. I’ll mention these in roughly the order they occurred to me. The font choice could have been more readable (smallish sans serif font, I found myself focusing on the text more than I like to), but that could just be my eyes giving out on me. Ascending attack bonus, descending saving throw target numbers. Both descending would be okay (though that was the first thing we houseruled in Erik Tenkar’s Adventurer Conqueror King campaign), both ascending would be better. Changing to ‘bad save = 0+level/n, good save = 2+level/2’ against a static DC of 15 would have been simpler to apply… but maybe I’m just too used to it being that straightforward. Changing bonus versus fixed DC is just easier for me. Related, some of the progressions aren’t entirely clear to me. They look almost linear by level, but the divisor is not jumping out at me. Class descriptions and summaries intermixed. I like the main page for each class. They each have a prominent page label, picture of a member of the class, summary section showing HD — including picture, class requirements, armor and weapons allowed, and class skills (you get all of them), and a D&D 3.x-style table showing level, cumulative Hit Dice, attack bonus, saving throw target values, level title, and spell slots. However, while each of these starts on a new page, the class description might start a page or two before that, so you flip to the very prominent and distinctive class main page, then hunt around for the text that goes with it. Minor pattern break: classes that get d4 hit points per level get +1 per level after 10d4, classes that get d6 hit points per level get +2 per level after 10d6, classes that get d8 hit points per level get +3 per level after 10d8, classes (barbarian) that get (gets) d10 hit points per level get +3 per level after 10d10… I’d be inclined to go +4 per level to continue the pattern. A few niggling editing oversights (yeah, I’m digging hard) that were pretty obviously fixed (such as a magic-user/thief getting ‘d4 hit points every level’ because they use the same HD — you’re supposed to alternate between lower HD on low levels and higher HD on even levels, and thieves get d6 HD. No index for the book. This might not be a big deal since the individual sections aren’t very big, but I just flipped through the entire ‘How to Play’ section looking for grappling rules (and didn’t find them, by the way). On the other hand, it’s not like it’s hard to go “best of Fort and Ref contested check, GO!” and you should have something workable. As I said, generally pretty petty. I’d be happy if I get Echelon out at a similar level of quality. For the third time, this is the Player’s Handbook I wish I had back in the day (what, near on thirty years ago? More than twenty-five, at least. Thanks for making me think of that, John). The things I don’t care for so much are minor, minor, minor compared to the good stuff I see here, and in some cases can be put down as a matter of taste (font choice, descending saving throw target numbers) as much as anything. I am very happy to have bought this. And I’m waiting for the Treasure Keeper’s Tome, and I’d like to see a monster book, too…. I really appreciate the review. Oh – and grappling is under the rules for Special Attacks in the combat section – page 54 in my review copy (might have changed in the final). I really thought about doing an index, but they’re devilishly hard to do solo – maybe for a revised edition in a few years. Ah, I see it now (page 56, in a table). I was skimming the headings rather than looking inside special attacks. It looks like it’s actually not too far off my contested saving throws idea, though I allowed for the use of agility or strength, whichever works better for you. You’re welcome for the review. I’m quite pleased with this book and I really look forward to the next one. Hey, I’m the assistant editor for the game. I did notice some of the editing errors you point out, but keep in mind B&T was a pretty big project for John, so he couldn’t have gotten everything I mentioned. We both did about two reads each for editing mistakes, but sometimes the tiny things get by. Oh well. Also, the TKT will have a bestiary, and a quite sizable one at that. It even includes templates from 3.5, so you can have a Psionic Lich if you REALLY want it. The editing issues were minor, but I noticed them. As I said, I’ll be pleased if I can get Echelon out the door in nearly this quality. Seriously. I bought a ‘professional’ supplement that had a cleric spell titled ‘Insight Rage’. I thought it might be something to do with Wisdom, the enraged target focuses his attention on his enemies and gets bonuses to Wisdom checks while… no, it was supposed to be Incite Rage. Now, this was in a heading style, so big text, bold, blue ink, the whole deal. That a couple little editing errors got past and are easily recognized and corrected by the reader is not, to me, a big deal. It’s evident what was meant, but they did stand out to me. Thanks for stopping by, Tanner. Ah, I thought they might have been, but I wasn’t certain. I was first exposed to paladins in AD&D1e Player’s Handbook, so I went with that. Pingback: Exploring the Megadungeon | Keith Davies — In My Campaign - Keith's thoughts on RPG design and play.